With a circulation of more than 1 lakh copies and a commanding readership of 5 lakhs, Dhanam has established its supremacy among the economic thinkers in Kerala. 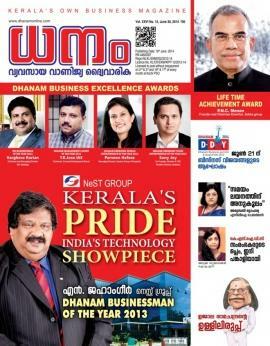 Launched in 1987, Dhanam is one of the most circulated business and investment periodical in malayalam. Being the most comprehensive business magazine which extensively covering business news around the globe is widely read by corporate managers, political leaders, decision makers and economic thinkers. With a core team of youngsters, Dhanam has contributed much in the policy decision making of the government. This top business magazine which gives regular updates on happenings in the corporate world has already created its own space in the hearts of the readers. Well supported by the selected and influential business persons both inside and outside Kerala, this magazine has created its supremacy in the business world. The highlight of the 'Dhanam' is the insightful reports, in-depth analyses, perceptive forecasts and enlightening business strategies about various industries. Branded as most popular business and investment magazine, Dhanam carries special features on topics related to industry, trade and capital markets, interviews with business leaders and investment tips. Innovative articles on new business opportunities are highly praised by the young business community. Published as a fortnightly by Dhanam Publications Pvt. Ltd, this business magazine is the favourite among Business Development Managers, Sr. Executives, Marketing and Business Analysts, and other Professionals. The articles published in the magazine greatly influence people belonging to various walks of life including Ministers, Media personnel and the general public. Special issues are being brought out from time to time with in depth coverage on a selected topic. People who can make strategic decisions, influence policy initiatives and make decisions on future investments and purchases keeps themselves updated with the content offered by this business magazine. Dhanam Publications, the pioneering business magazine in Kerala also institute the prestigious Dhanam Business Excellence Awards to honour those eminent personalities who made outstanding contribution to development of industry in the state. The 2014 edition of the Business Summit and Award Nite was arranged at Le Meridien Convention Centre, Kochi. The first Dhanam Lifetime Achievement Award was presented to eminent businessman P.N.C.MenonN Jehnagir, the Vice-Chairman and Managing Director of NeST Group was presented with the Dhanam Businessman of the Year 2013 Award. So if you are business person dreaming to excel in the field, 'Dhanam' will be the best choice to sharpen your thoughts and fly high.